Do you have a big idea for a new business? 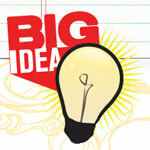 If you do (and you’re in high school) the Big Idea competition is right up your alley. High school students can compete for cash and scholarships by submitting a 1,075-word description of their business idea. Returning again this year is the Marketing Design competition where students can choose to also create a logo and ad for their idea. This competition for high school students in Aberdeen and the surrounding region was created through the collaborative efforts of many organizations and is funded by Absolutely!Aberdeen. This competition is about exposing youth to new ideas and innovation in the hopes that you will view entrepreneurship as an option for your future. Rather than leaving the region to look for a job, you can have the confidence to create your own opportunities close to home and know that there is support for you should you choose to do so. Homegrown businesses are key to the success of our rural communities. Cash prizes, a chance to meet other students interested in entrepreneurship, recognition and awards are just some of the features of this competition. The first place winner will receive $1,000, second place wins $500 and $250 for third place. College scholarships will also be awarded. A $500 prize is awarded to the winner of the marketing design competition. On Hand Development would assist any students that are interested in entering the contest. Just give us a call at 853-3098. I’ve always known that the Miller High School was an excellent institution and that it was a place my kids would receive a good education. Like many people from small towns, I like to brag about our local education system. However, it is always good to hear the same thing from an outside source. U.S. News and World Report magazine has just provided that unbiased feedback. Miller High School received a silver medal in their rankings. While there were no gold medal schools in South Dakota this year, Miller High School is the only silver medal winner in the state! How cool is that? Way cool! The America’s Best High Schools project is an annual report that identifies the country’s top-performing high schools. The goal is to provide a clear, unbiased picture of how well public schools serve all of their students – from the highest achieving to the lowest achieving – in preparing them to demonstrate proficiency in basic skills as well as readiness for college-level work. Congratulations to the Miller High School staff, administration, and students for earning this prestigious award. If you happen to see our teachers, administrators, or students, be sure to let them know you are proud of them for making Miller High School the best high school in the state of South Dakota.